Most little girls ask Santa for a pony or Barbie’s latest dream house. Regardless of the fact that it was ingrained into my tiny head from a young age that Santa wasn’t in fact, real (if he was he would give presents to all the little Jewish girls and boys too), ponies and dream houses were the least of my concerns. What I really wanted was…a Kitchen Aid Mixer. You know, the thing engaged couples register for at Bed, Bath, & Beyond. But my lack of a fiancé didn’t stop me…besides, boys have cooties, right? I begged and pleaded for a Kitchen Aid for years. With its shiny silver bowl, smooth red surface, and interchangeable mixers, I had my eyes on the prize. Each year, I was denied the appliance of my dreams, even until it was time for me to leave the nest and head to college. Weeks after the big move, I received a phone call from my father, informing me of the latest addition to our kitchen. That’s right, he had replaced me with the thing I wanted most. A Kitchen Aid. For months, I brooded over my long distance relationship with Big Red and waited anxiously for our introduction. Months later, with a Freshman year report card in one hand and a plane ticket in the other, I headed home to sunny Los Angeles. Sure enough, she was waiting for me, shiny as ever and ready to be christened. My culinary interest was piqued by my Grandmother, who, years ago, presented a fun-sized me with “The Magic Spoon Cookbook.” This collection of recipes came with a “magic spoon,” filled with glitter and sequins (clearly the source of its supernatural abilities). Each recipe involved the use of this enchanted utensil. But after one fateful cycle in the dishwasher, it was never seen again. A temper tantrum or two later, I realized that the show could go on without my trusty tool. For years, I swore by the cookbook as I traipsed around the kitchen in my chef hat and apron. My favorite recipe? Banana Dana Bread. It was simple, fun, and the only way I could get my Dad to let me eat bananas (apparently I was allergic). After diligent practice, years of hands-on research, and a few floury messes, I bring you an all new, reinvented, Banana Dana Bread! Finally, I’ve managed to combine my childhood dream with one of my favorite memories. And guess what? I was right; food does taste better when it’s made with a Kitchen Aid! Seriously, I should be their spokesperson. Nonetheless, this summer I’ll be making up for all those lost afternoons without my electrical pal. But lets not get ahead of ourselves. Focus. Banana Bread. My prime discoveries over the years: cinnamon and chocolate chips. The cinnamon gives the loaf an unexpected kick and the chocolate – well – that one speaks for itself. This recipe yields a moist, fluffy loaf full of flavor and pizzazz. And the best part is, its breakfast and dessert! Now, I’m the resident baker here, so there were slim pickings for this inaugural baking endeavor. I had to alter my recipe a bit to make ends meet, which is reflected in the above proportions. Turns out, less flour and sugar is a good thing! At any rate, I’ll be making a trip to the grocery store to restock, since I’ve managed to deplete all of this kitchen’s recourses. Start out by preheating the oven to 350 degrees Fahrenheit. Find a pan around 8X6 inches (I used an 8 ½ X 6 ½ ) and butter it up. I usually wait on this step until I’m ready to pour in the batter, but I’ll follow the recipe formula just to keep cool with the baking police. In a bowl, cream together the butter and sugar – or use a Kitchen Aid if you’re lucky enough. 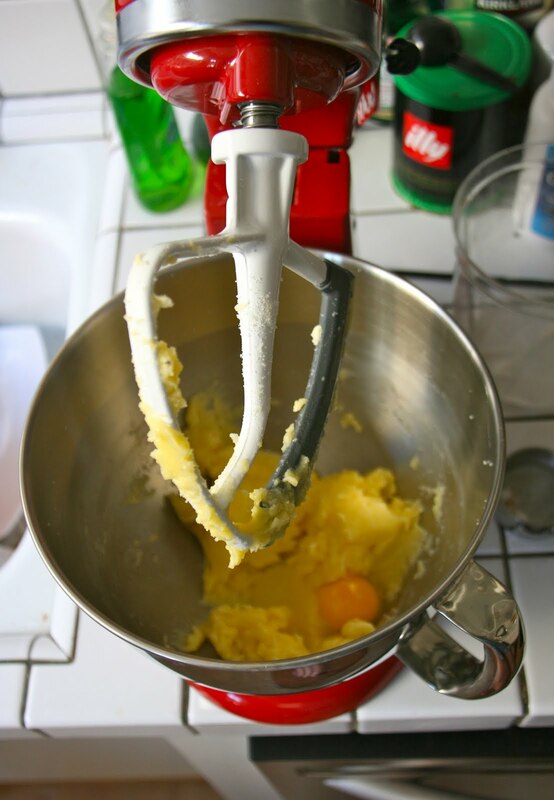 Then add the eggs, mixing them in, one at a time. Next, peel your ripe bananas and put them in a bowl. Using a fork, mash them up as much as possible. Depending on how patient you were in letting your bananas ripen, you might need to put a little muscle into this one. Scrape the mashed bananas into the mixing bowl along with the milk and vanilla. Stir them all together, but be careful not to over-mix. This will just give you rubbery bread that’ll only satisfy the appetite of your garbage disposal. In a separate bowl, mix dry ingredients together. Add flour mixture to banana mixture in small batches, mixing on medium speed. And finally, we add the best part: CHOCOLATE! “Plenty of chocolate chips” may be a little too vague, so to clarify, I recommend piling a half-cup high with these tasty morsels. And maybe throw another handful in there too if you’re a Sweet Tooth like myself. Last but certainly not least comes the cinnamon. I never use measuring spoons for this spice because, well, I usually like to use more than recipes allot. Give the container a few shakes and mix it in until it’s all blended. Pour the batter into the pan and place it in the preheated oven for around 50 minutes. All ovens vary, so make sure to stick a toothpick in it after about 40 minutes. While you’re waiting, don’t hesitate to lick the bowl clean! (I’m convinced salmonella is a myth). When the toothpick comes out clean, take out the bread and let it cool until you just can’t resist anymore!